At Amity we are passionate about grooming leaders who are not only thorough professionals but also good human beings with values and sanskars. This is just one of the many reasons given below, why we are consistently ranked no.1. At Amity we benchmark only against the best institutions around the world. Our faculty and senior team travel all over the globe to learn and imbibe the best practices so that we can give a solid foundation for learning. 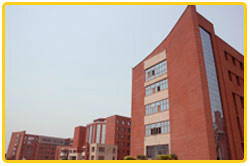 As part of this endeavour, we have air-conditioned amphitheatre style classrooms that provide the most conducive atmosphere for dynamic and focused discussions, while the libraries at our campus are equipped with over 1,00,000 books, periodicals, national and international journals, CD-ROMS, covering all aspects of academic studies and research material. The hi-tech labs act as ideal training grounds for budding professionals that allow students to experiment and bring to practice what they have learnt in theory. 4,000 strong faculty led by 11 former Vice Chancellors, former Chairman of UGC and Vice Chairman of AICTE. Leading corporate professionals, as visiting faculty, share rich industry experience. 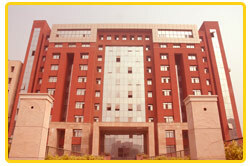 Amity institutions are constantly ranked amongst the top. Biggest strength of Amity. A unique Corporate Resource Centre to facilitate excellent placements. Alumni all over the world in leading companies like McKinsey, Ernst & Young, HLL, and Reliance. Over 4000 students have got on-campus placements this year and over 800 students gave been placed even one year before graduating. Over 1500 CEOs interact through CEO Dinner Series, CEO Forums and guest lectures. Corporate and Alumni Mentor for every student. Amity has organized or been academic partner to over 300 seminars. Amity is the only institution to have helped invite over 50 leading Gurus like Tom Peters, Kenichi Ohmae, Robert Kaplan, and Ricardo Semler over the last few years. Only the best of the students get admission in Amity. For example, Very limited students are handpicked out of over 1,50,000 applicants. Final interview panel includes senior corporate leaders. 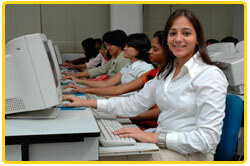 Amity has over 1,00,000 students across 240 programs like law, journalism, telecom, biotechnology, etc. giving you a chance to forge lifelong friendships across virtually all professions. An opportunity, which very few business schools can offer. Practical industry-oriented teaching. Contemporary curriculum updated by Industry Advisory Board. Specialization in any of 8 areas with equal number of basket courses. Certificate courses in foreign business language, values and ethics, art appreciation, golf. Military training camps to inculcate leadership and patriotism. Thousands of students from all across the country live in Amity Residences, which come closest to being 'a home away from home'. The separate facilities for boys and girls, caring wardens and a tight security.